You will read below why I cloth diaper. 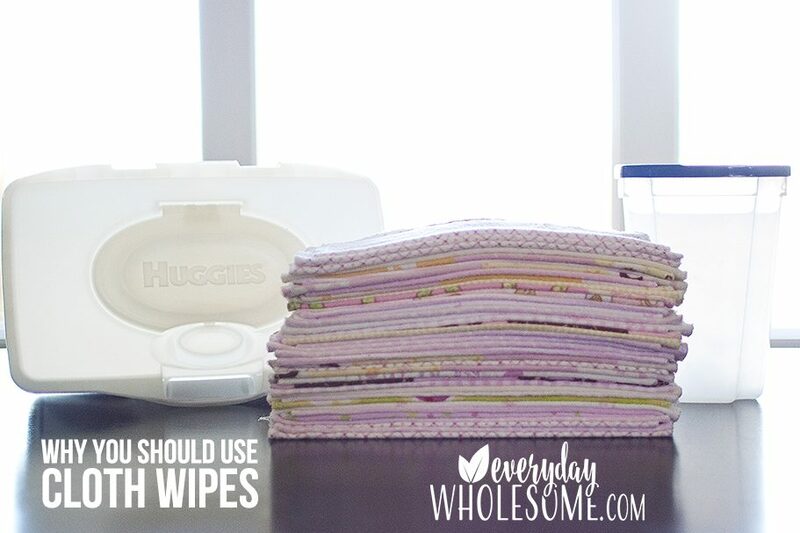 Why I use DIY homemade cloth baby wipes. I CLOTH DIAPER. I love it. It’s a little extra work. BUT, it’s so much better for my baby. When things get busy we all need to cut things out and simplify but for some reason I have always liked cloth diapers. Probably because I never did much else so I just KNOW cloth. It’s my comfort zone. It gives me peace of mind on my “crunchy journey” and it’s one less thing for me to worry about. It’s cheaper (or it can be). It’s so adorable. I love fluffy bums. I am kind of grossed out by full, disposable diapers. I’d rather spray poop into the toilet than smell a full, disposable diaper. That’s just me! I’m a committed cloth diapered. Through and through. It is HARDER and more complicated to use disposable wipes with cloth diapers. We were in the habit of putting the dirty wipes into the dirty diapers and then we had to get the wipes into the trash or the diaper genie thing & the cloth diapers into the wet bag for the wash. It was a mess. I ended up washing disposable wipes on accident and it was a pain to sort during laundry time and they ruined the velcro. Boo. And just yuck. It’s easier to just wash it all. It’s cheaper. We used a TON of wipes. We used a new wipe for every swipe. 🙂 We were going through wipes like MAD! It was one of those expenses like paper towels that I thought was easy to lower and I would like to use that money on other things. so many other things on my wish list that are far more fun than the recurring cost of wipes. Helps the environment. Read: going through wipes like mad. 🙂 But no matter how many wipes you use, you’ll save money. I don’t like the chemicals in wipes. The skin absorbs those chemicals through the thin skin of privates so it’s just bad for her. And, the organic and healthier versions I still feel are using unnecessary chemicals in order to preserve those wipes on the shelf for that long. [This post is about 8 years old. There are more and better options now. I prefer these three disposable wipes for when we go out and about: YL Seedlings. Honest Company wipes. Water Wipes. Less rashes. I feel like we get much less diaper rash and redness with cloth wipes, but if there already is redness on a booty, I feel better about wiping a red booty with a natural, cloth wipe. Better Material. I like the texture, thickness and wetness of the wipes I choose. I can customize my wipes the way I like them. The disposable wipes always left flakes or would smear the poo instead of wiping it off. TRULY ALL YOU NEED IS CLOTH WIPES & A CONTAINER. But if you wish to make it more complicated you can! See below. I TRY to keep things pretty simple these days. Travel Wipes Containers – if you choose. I take disposable wipes with me on the go now. Cloth Wipes solution or look up my recipe on this post about my DIY wipes. Water, microwave & mason jar to mix/melt the solution if you buy the kind that needs to be melted. I prefer none or making my own these days with essential oils. 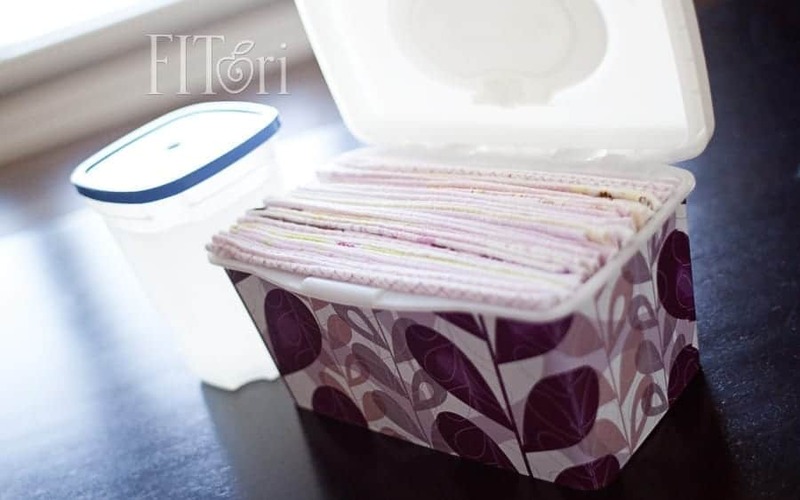 WHERE DID YOU BUY OR MAKE YOUR DIY NO SEW CLOTH WIPES? UPDATE 2018: I made my own DIY NO SEW BAMBOO CLOTH WIPES for Baby #3. Read the full post here. Before making my own, I bought my flannel wipes from As You Stitch Baby. 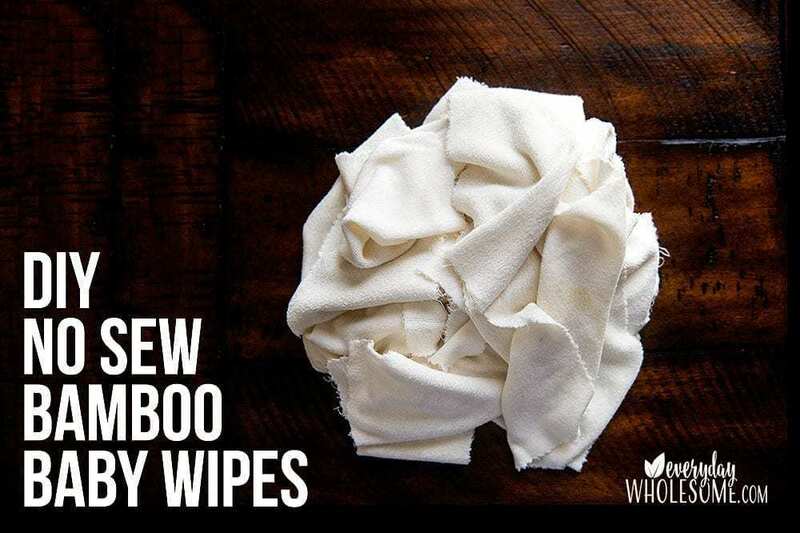 I loved them but I love love love my bamboo wipes so much more! I like pretty thin wipes. I used the flannel ones then and now the bamboo no sew DIY ones now for everything. Faces. Hands. Booties. As Washcloths. As Wipes. Love them. WHAT DO YOU USE FOR CLOTH WIPE SOLUTION? With baby #1 I bought solution on Amazon. It smelled nice. It had soap in it. I microwaved and then mixed in a mason jar (I think I used plastic back then…gasp! but I didn’t know any better. 8 years later on my wellness journey I would use a mason jar.) and then put it in the nursery drawer. I would pour some solution over the dry wipes in the container and make them wet. NOW, 8 years later I just use water on the wipes. READ MORE ABOUT IT IN MY DIY NO SEW BAMBOO CLOTH WIPES POST. Then I soothe the booty with the same oil and essential oil solution I would have made. I use YL Seedlings Baby Oil and YL Seedlings Baby Diaper Rash Cream if there’s any redness. DO YOU PRE-SOAK YOUR WIPES OR DO YOU USE A SPRAY BOTTLE? I have a spray bottle pre-mixed w/ solution just in case I run out of wet wipes. But, personally I prefer the wet wipes. I don’t wet too many wipes at a time. One large huggies box at a time. I don’t like to give them the chance to mold. I put this in detail in my post about my DIY NO SEW BAMBOO CLOTH WIPES SOLUTION. CLOTH WIPING ON THE GO?! Before I leave the house, I pack my bag. My favorite diaper bag right now came from Target and isn’t a diaper bag at all. I’ll try to find a pic. First baby…..I have a spitter baby so half the bag is burp cloths, bibs and a couple changes of clothes. I also take a few diapers. I pack a “wet tote” for dirty diapers. hair bows. Etc. Anyway, before I leave I will fill my small travel wipes container with wet cloth wipes from my big wipes container in the nursery so I know I have fresh wipes. I can refill the big wipes container when I get home if needed, since I have a stash of wipes solution handy in the nursery, already made! I take the “old” wipes out if they’ve been sitting in my “on-the-go bag” a few days or a week and I put them right in my “wet tote” bag or right in the washer. LETTER TO MY OLD, NEW MOMMY SELF. That was way too complicated old self, young self. Love, your older, more mature, simpler, busier self. Now, with baby #3 I take disposable wipes with me because it’s too complicated to pack my wet wipes and unpack my wet wipes. I take disposable wipes with me in my bag. I do cloth diaper on the go but I do not cloth wipe out and about.